Shouldn’t it be easy to determine which chalk to play and which chalk to fade? If he performed well, you OBVIOUSLY should have rostered him. If he had a dud you had to have seen it coming and faded him, right? Right?? In football, particularly NFL DFS, there is no such thing as a ‘perfect spot.’ It is a high variance, event driven sport. Injuries happen all the time. A pass interference call in the endzone can take 7 fantasy points away from a receiver with a great matchup and give them to a running back in a bad matchup. No matter who the player is there is always a reason to fade when ownership is projected to be high. For players who have won GPPs, projecting ownership and using those numbers to their advantage is crucial. How do we decide which players to play and which to fade? It’s not as simple as fading everyone over the ownership % you determine to be ‘chalk.’ If a 25% owned player has a top 2 or 3 week at his position and you have none of him on your rosters you are at a huge disadvantage. Pricing plays a huge role in determining chalk and can often determine the difference between what I’m going to define as ‘Good Chalk’ and ‘Bad Chalk.’ If you look at ownership projections you will often see a few low-priced players near the top. Every now and then it is just a simple misprice. Perhaps an injury has thrusted a cheaper player into a larger role while he is still priced based on his previous one. Generally, the cheaper a chalky play becomes the safer it is to play him and the riskier it is to fade him. One obvious example of this came in week 8 last season when Devontae Booker became the number 1 RB in Denver due to an injury suffered by CJ Anderson after pricing had come out. This left Booker as a massive bargain at $3700 on DraftKings as a home favorite. He didn’t have a massive game for RB1 standards with 18.4 DK points (RB11 for the week) but still scored almost 5x his salary for the week. His exceptionally low salary coupled with his high-volume projection (he finished with 19 carries, 5 receptions) and favorable matchup gave him a safe enough floor to plug into your lineups. Booker gave you the flexibility to do almost anything with the rest of your roster while carrying almost no risk beyond the ever-present chance of injury. Booker was the closest example to ‘good chalk’ that you’ll ever find. These opportunities generally present themselves a few times a year and are generally referred to as ‘Free Squares’ around the daily fantasy industry. Fading a player in this situation has a similar expected value as declining to stamp your free middle square in a game of bingo. I’ll go to week 12 for an example of ‘bad chalk.’ Amari Cooper was talked up by EVERYONE all week as a high upside player in a great matchup. Typically a boom or bust player, Cooper was matched up against the Panthers and their terrible secondary in one of Vegas’s highest totaled games of the week. When lineups locked Cooper predictably turned out to be one of the highest owned GPP plays of the day at $7700 on DK. His stat line for the day? 4 receptions on 7 targets for a measly 22 yards and 6.2 DraftKings points. Both Michael Crabtree and Seth Roberts outscored him on his own team and Ted Ginn Jr led all players in the game with over 25 points. It is not just being results oriented to say that Cooper was bad chalk in this game. For one, his price tag – while reasonable – wasn’t low enough to make him the ‘Free Square’ type play that Booker was in week 8. Secondly, Cooper is widely known as a high-variance player. Not every decision is as easy as those two. If it were, good plays would always be chalk and bad plays would rarely be rostered. Price, floor and expected roles are the most important things to look for in your chalky plays. If you look at the winning rosters of large field GPPs you will often find David Johnson/LeVeon Bell types as the highest owned players on their rosters. Despite being at the top of the salary range for their position every week DJ and Bell had exceptionally high floors due to their consistent targets/receptions in addition to their bell-cow roles carrying the ball. With these roles the main reason to fade is always injury concern (This would have worked with fading Johnson in week 18). Their role is so secure that even in a bad game they will deliver enough fantasy points to be on a profitable roster. More importantly they will be on 20% of rosters most weeks when they exceed expectations, making them must-plays if you want to have a positive ROI for the week. Players like Davante Adams and Brandin Cooks are the perfect plays to roster around 5% ownership as they can go off at any given time, but are just as likely to post a poor performance as their fantasy points are based off more volatile statistics like touchdowns (Adams) and high depth of target receptions (Cooks). To put it simply, there are two main aspects to look at when determining whether to roster chalk. Their price (ideally low) and their floor (ideally high). Devontae Booker was an example of a player checking both of those boxes and clearly setting up as a free square on any roster. The combination of the two of these enables you to give yourself enough differentiation with the rest of your team to regain any leverage you may have lost with such a popular play. 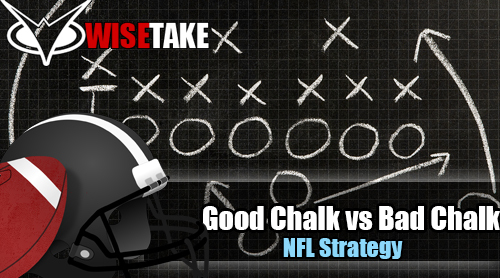 Fading chalk is hard – even when you know it’s the right play. For the most part these guys are chalk for a reason and it is a terrifying thought to fade a high-ceiling receiver in a perfect matchup. Just remember that GPPs have very top-heavy payout structures and that the top payout is likely the reason you are playing. Fading a popular player will let you gain ground on a large percentage of the field every time they underperform, much more ground than you would gain by rostering them if they play well. And like our good friend Ricky Bobby so eloquently put it – ‘If you’re not first, you’re last.’ Might as well shoot for the top! That was an AWESOME article thanks for the breakdown I fell into the bad chalk last year with Cooper.